Dr.-Ing. Axel Sikora holds a diploma of Electrical Engineering (M.Sc.) and a diploma of Business Administration (M.B.A), both from Aachen Technical University. He has done a Ph.D. in Electrical Engineering at the Fraunhofer Institute of Microelectronics Circuits and Systems, Duisburg, with a thesis on SOI-technologies. 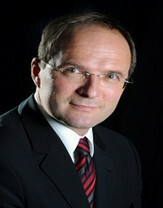 After various positions in the telecommunications and semiconductor industry, he became a professor at the Baden-Wuerttemberg Cooperative State University Loerrach in 1999. In 2011, he joined Offenburg University of Applied Sciences, where he holds the professorship of Embedded Systems and Communication Electronics.